Ecstasy is one word used for the drug or substance methylenedioxy methamphetamine or MDMA and related substances. Under Schedule 1 of the Drugs Misuse and Trafficking Act 1985, ecstasy or MDMA is classified as a prohibited substance. Section 25 of the Act makes it an offence to supply prohibited substances under Schedule 1. There are two ways the law considers or calculates the amount of a particular prohibited substance found to be in the possession of a person. Firstly, by ‘discrete dosage unit’ and secondly by weight. Discrete dosage unit or ‘DDU’ means an amount of the prohibited drug, which is prepared or apparently prepared for the purpose of being administered as a single dose. In relation to ecstasy or MDMA, this will generally mean a pill or capsule. Depending on the specific type of MDMA, ecstasy is generally classified in the following amounts under Schedule 1 of the Drugs Misuse and Trafficking Act 1985. If you are charged with supply of prohibited drugs or supply ecstasy, the Crown must prove 3 facts to establish this charge and each fact must be proved beyond a reasonable doubt. Firstly, that you supplied a substance. Secondly, that the substance you supplied was a prohibited drug. Thirdly, that you knew that what was supplied was a prohibited drug. In proving the first fact, the Crown must establish beyond a reasonable doubt that the accused intentionally gave or provided the substance to somebody else, whether by way of sale or otherwise. In proving the second fact, the Crown does not have to prove that all of the substance supplied was prohibited. Any substance, which contains a prohibited drug in any proportion, is treated as a prohibited drug. This means that the purity of the substance in question is not relevant. In proving the third fact, it is not essential for the Crown to prove that the accused knew the drug was the drug specified in the charge. The Crown only needs to prove that the accused knew or believed that the substance was a prohibited drug. The Crown may do this by demonstrating that the accused knew or believed that the substance supplied was a prohibited drug or was conscious that there was an actual chance that it was. The Drugs Misuse and Trafficking Act is drafted so that even where a person supplies a substance which is not a prohibited substance but for the purposes of the supply is represented as being a prohibited substance, it is deemed that whatever is supplied is a prohibited substance. In other words, supplying someone with a substance and pretending the substance is a prohibited substance or drug is the same as actually supplying someone with a prohibited substance such as ecstasy: Section 40. A representation by the accused that the substance is a prohibited substance may be verbal, in writing or by conduct. Where a person is charged with supplying a commercial quantity of the prohibited drug or MDMA (generally 250 g), the Crown must prove a fourth fact beyond a reasonable doubt. This is that the amount of the drug supplied was not less than the quantity prescribed by law for the specific drug in question as being the commercial quantity. The Crown must also prove that the accused knew or believed at the time the substance was supplied that they were supplying an amount which was not less than the commercial quantity or was aware that there was an actual chance that it was. In prosecuting this offence, the legal meaning of the word ‘supply’ goes beyond its normal meaning. In determining whether or not a person is guilty of ‘supply’, the court considers whether the person had in their possession a substance, which is a prohibited drug for the purpose of giving it or providing it to another person. The law provides that if an accused has in his or her possession a specified quantity or more of a prohibited drug then they will be deemed to have possession of the drug for the purpose of supplying it to someone else. If the court is satisfied of all of these elements, then the onus will be on the accused to prove to the court that he or she had the drug in their possession for a reason, which was not for the purpose of supply. The onus will be on the accused to prove that they had the drug in their possession for a purpose other than to give it to somebody else. The accused may argue here that all of the drug was for their own use or that they were returning the drug to someone else who actually owned it: see R v Carey (1990) 20 NSWLR 292. An accused relying on such a defence needs to prove this on the balance of probabilities and not beyond a reasonable doubt. 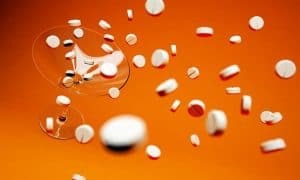 It is essential that a person charged with ecstasy possession, dealing, trafficking or supplying a prohibited substance or drug such as ecstasy or MDMA speaks with an expert criminal defence lawyer so that they are aware of their legal position and rights. If you have been charged with an ecstasy offence, call George Sten & Co Criminal Lawyers. We are available 24 hours a day, 7 days a week and can be contacted on (02) 9261 8640 during business hours or 0412 423 569 outside of business hours. We may also be contacted via email at georgesten@criminal-lawyer.com.au.